Yogurt is a dairy product, which is made by blending fermented milk with various ingredients that provide flavour and colour. It is believed that yogurt originated in Mesopotamia thousands of years ago. Evidence has shown that these people had domesticated goats and sheep around 5000 B.C. The milk from these animals was stored in gourds, and in the warm climate it naturally formed a curd. This curd was an early form of yogurt. Eventually, a process for purposely producing yogurt was developed. While yogurt has been around for many years, it is only recently (within the last 30-40 years) that it has become popular. This is due to many factors including the introduction of fruit and other flavorings into yogurt, the convenience of it as a ready-made break-fast food and the image of yogurt as a low fat healthy food. Manufacturers have responded to the growth in the yogurt market by introducing many different types of yogurt including low fat and no-fat, creamy, drinking, bio-yogurt, organic, baby, and frozen. Traditional yogurt is thick and creamy. It is sold plain and in a wide assortment of flavors. These are typically fruit flavors such as strawberry or blue-berry however, newer, more unique flavors such as cream pie and chocolate have also been introduced. Cereals and nuts are some-times added to yogurts. Yogurt makers also sell products with a varying level of fat. Low fat yogurt, which contains between 0.5% and 4% fat, is currently the best selling. Diet no-fat yogurt contains no fat at all. It also contains artificial sweeteners that provide sweetness while still reducing calories. Creamy yogurt is extra thick, made with whole milk and added cream. Drinking yogurt is a thinner product, which has a lower solids level than typical yogurt. Bio-yogurt is made with a different type of fermentation culture and is said to aid digestion. Yogurt that is made with milk from specially fed cows is called organic yogurt. This type of yogurt is claimed to be more nutritious than other yogurts. Other types of yogurts include pasteurized stirred yogurt that has extended shelf life, baby yogurt made specifically for children, and frozen yogurt. The yogurt itself has a generally aldehydic flavor, which is a result of the fermentation process. Since it is made from milk, yogurt is rich in nutrients. It contains protein and vitamins and is a rich source of calcium. In fact, a small container of yogurt contains as much calcium as a third of a pint of milk. In addition to these nutritional characteristics, yogurt is also thought to have additional health benefits. One of the suggested benefits of yogurt is that it acts as a digestive aid. In the body, it is thought that yogurt can encourage the growth of beneficial bacteria in the gut. These organisms help to digest food more efficiently and protect against other, harmful organisms. Another health benefit of yogurt is for people that are lactose intolerant. These people have difficulty digesting milk products however, they typically can tolerate yogurt. When the milk arrives at the plant, its composition is modified before it is used to make yogurt. This standardization process typically involves reducing the fat content and increasing the total solids. Once modification occurs, it is pasteurized to kill bacteria and homogenized to consistently disperse fat molecules. (Lactobacillus bulgaricus). During fermentation, these organisms interact with the milk and convert it into a curd. They also change the flavor of the milk giving it the characteristic yogurt flavor of which acetaldehyde is one of the important contributors. The primary by product of the fermentation process is lactic acid. 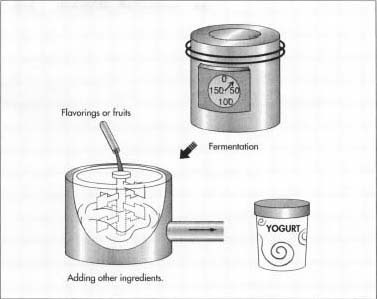 The acid level is used to determine when the yogurt fermentation is completed which is usually three to four hours. The suppliers of these yogurt cultures offer various combinations of the two bacterial types to produce yogurts with different flavors and textures. To modify certain properties of the yogurt, various ingredients may be added. To make yogurt sweeter, sucrose (sugar) may be added at approximately 7%. For reduced calorie yogurts, artificial sweeteners are used. Cream may be added to provide a smoother texture. The consistency and shelf stability of the yogurt can be increased by the inclusion of stabilizers such as food starch, gelatin, locust-bean gum, guar gum and pectin. These materials are used because they do not have a significant impact on the final flavor. The use of stabilizers is not required however, and some marketers choose not to use them in order to retain a more natural image for their yogurt. To improve taste and provide a variety of flavors, many kinds of fruits are added to yogurt. Popular fruits include strawberries, blueberries, bananas, and peaches, but almost any fruit can be added. Beyond fruits, other flavorings are also added. These can include such things as vanilla, chocolate, coffee, and even mint. Recently, manufacturers have become quite creative in the types of yogurt they produce using natural and artificial flavorings. The general process of making yogurt includes modifying the composition of and pasteurizing the milk; fermenting at warm temperatures; cooling it; and adding fruit, sugar, and other materials. The milk substance is fermented until it becomes yogurt. Fruits and flavorings are added to the yogurt before packaging. the yogurt by reducing the tendency for it to separate on storage. 2 After the solids composition is adjusted, stabilizers are added and the milk is pasteurized. This step has many benefits. First, it will destroy all the microorganisms in the milk that may interfere with the controlled fermentation process. Second, it will denature the whey proteins in the milk which will give the final yogurt product better body and texture. Third, it will not greatly alter the flavor of the milk. Finally, it helps release the compounds in milk that will stimulate the growth of the starter culture. Pasteurization can be a continuous-or batch-process. Both of these processes involve heating the milk to a relatively high temperature and holding it there for a set amount of time. One specific method for batch process pasteurization is to heat a large, stainless steel vat of milk to 185° F (85° C) and hold it there for at least 30 minutes. 3 While the milk is being heat treated, it is also homogenized. Homogenization is a process in which the fat globules in milk are broken up into smaller, more consistently dispersed particles. This produces a much smoother and creamier end product. In commercial yogurt making, homogenization has the benefits of giving a uniform product, which will not separate. Homogenization is accomplished using a homogenizer or viscolizer. In this machine, the milk is forced through small openings at a high pressure and fat globules are broken up due to shearing forces. 4 When pasteurization and homogenization are complete, the milk is cooled to between 109.4-114.8° F (43-46° C) and the fermentation culture is added in a concentration of about 2%. It is held at this temperature for about three to four hours while the incubation process takes place. During this time, the bacteria metabolizes certain compounds in the milk producing the characteristic yogurt flavor. An important byproduct of this process is lactic acid. 5 Depending on the type of yogurt, the incubation process is done either in a large tank of several hundred gallons or in the final individual containers. Stirred yogurt is fermented in bulk and then poured into the final selling containers. Set yogurt, also known as French style, is allowed to ferment right in the container it is sold in. In both instances, the lactic acid level is used to determine when the yogurt is ready. The acid level is found by taking a sample of the product and titrating it with sodium hydroxide. A value of at least 0.9% acidity and a pH of about 4.4 are the current minimum standards for yogurt manufacture in the United States. When the yogurt reaches the desired acid level, it is cooled, modified as necessary and dispensed into containers (if applicable). 6 Fruits, flavors, and other additives can be added to the yogurt at various points in manufacturing process. This is typically dependent on the type of yogurt being produced. Flavor in non-fruit yogurts are added to the process milk before being dispensed into cartons. Fruits and flavors can also be added to the containers first, creating a bottom layer. The inoculated milk is then added on top and the carton is sealed and incubated. If the fruit is pasteurized, it can be added as a puree to the bulk yogurt, which is then dispensed into containers. Finally, the fruit can be put into a special package, which is mixed with plain yogurt upon consumption. 7 The finished yogurt containers are placed in cardboard cases, stacked on pallets, and delivered to stores via refrigerated trucks. Milk products such as yogurt are subject to a variety of safety testing. Some of these include tests for microbial quality, degree of pasteurization, and various forms of contaminants. The microbial quality of the incoming milk is determined by using a dye reaction test. This method shows the number of organisms present in the incoming milk. If the microbial count is too high at this point, the milk may not be used for manufacture. Since complete pasteurization inactivates most organisms in milk, the degree of pasteurization is determined by measuring the level of an enzyme in the milk called phosphatase. Governmental regulations require that this test be run to ensure that pasteurization is done properly. Beyond microbial contamination, raw milk is subject to other kinds of contaminants such as antibiotics, pesticides or even radioactivity. These can all be found through safety testing and the milk is treated accordingly. In addition to safety tests, the final yogurt product is also evaluated to ensure that it meets the specifications set by the manufacturer for characteristics such as pH, rheology, taste, color, and odor. These factors are tested using various laboratory equipment such as pH meters and viscometers and also human panelists. The future of yogurt manufacturing will focus on the development of new flavors and longer lasting yogurts. The introduction of new flavors will be driven by consumer desires and new developments by flavor manufacturers. The suppliers of the bacterial cultures are conducting research that hints at the development of uniquely flavored yogurts. By varying the types of organisms in the cultures, yogurt is produced much faster and lasts longer than conventional yogurt. Additionally, the nutritional aspects of yogurt will be more thoroughly investigated There is some evidence that has shown consumption of yogurt has a beneficial antibiotic effect. It has also been shown to reduce the incidence of lactose intolerance and other gastro-intestinal illnesses. Other purported benefits of yogurt include the reduction of cholesterol, protection against certain cancers, and even boosting the immune system. The research is still not complete on these benefits however, these factors will likely be important in the continued market growth of yogurt.